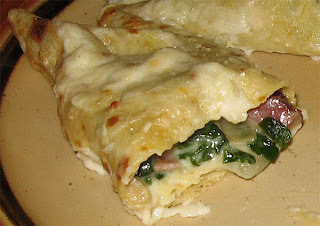 Today's yum were crespelle filled with spinach, ham, bacon, onion, parmigiano reggiano and bechamel. Topped with more bechamel and parmigiano. In essence, these are Italian crepes (crepe:France = crespelle:Italy) with sauteed goodness added to them, rolled, and placed in an oven (top rack) for 5 minutes at 450 degrees. Then they go in the broiler for a minute or two to brown the top. Rich as hell, delicious, not at all healthy. Northampton, MA is home to many a restaurant that are but shiny veneers with bland eats. My kitchen dominates these pretenders.